Red dwarfs stars, the most common stars in the galaxy, are bathing planets in their habitable zones with potentially deadly stellar winds, a finding that could have an impact on finding life beyond Earth. About 70% of stars are red dwarfs, or M-type stars, which are cooler and smaller than the sun. Any red dwarf planets suitable for liquid water, therefore, would have to orbit much closer to their parent star than Earth circles the Sun. That presents a problem for life, at least life as we know it on Earth, says physicist Ofer Cohen with the Harvard-Smithsonian Center for Astrophysics. Cohen and colleagues used a computer model based on data from the Sun's solar wind, a continuous stream of charged particles that permeates and defines the solar system, to estimate the space environment around red dwarf stars. "We find that the conditions are very extreme. If you move planets very close to the star, the force of this flow is very, very strong. Essentially it can strip the atmosphere of the planet unless the planet has a strong magnetic field or a thick atmosphere to start with," says Cohen. 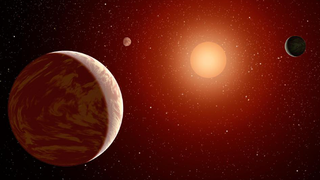 To be the right surface temperature for water, a planet would need to be about 9.3 million to 18.6 million miles from its host red dwarf star. By comparison, airless Mercury is about 36 million miles from the sun. Earth is about 93 million miles away. Solar radiation pressure, however, is about the same for Sun-like stars and red dwarfs. "You have stronger flow as you move closer and closer," Cohen says. "It applies a stripping force on the planet. It's mostly due to the fact that they are close, it depends less on the star itself." Red dwarf stars also are more magnetically active than the Sun and emit more x-ray and ultraviolet light, factors that can heighten space weather impacts, he adds. "Planets may lose their atmospheres much faster," due to star flares and other solar-type storms, Cohen says. While the research paints a dim prospect for life on red dwarf planets, there is the potential that life doesn't need an atmosphere or magnetic field to arise. "We find life in environments without oxygen, with too much oxygen. We find bacteria that likes to live in the centre of nuclear reactors. They like all the radiation. Nobody expects life to be there, but we find it," says Cohen. "Maybe we should not assume that life should be exactly as we know it." The research was presented at the American Astronomical Society meeting in Boston this week.